For centuries some people have had the need to leave evidence of their presence on this fragile planet by leaving marks on places of significance and status. These marks are an attempt to commemorate their fleeting visit and are often an attempt to leave some permanent reminder of the transient nature of their life. The marks are usually in the form of a written of carved scrawl – graffiti. They are also a form of cultural vandalism when they permanently deface an historic or iconic location or object. Locations as far apart as the Pyramids of Egypt to Machu Picchu in Peru, and from the Rock Drawings of Southern Africa to the Ruins of Pompeii all carry scars of this human need to leave a mark. Recently a new version of this seemingly insatiable need to record our passing journeys has started to appear at heritage and sites around the world – locks. Padlocks fastened to places to “lock in" either a relationship to another person, or a supposed relationship to the actual visited site. This idea on the surface seems quaint and innocent, but as ever increasing tourist numbers already put pressure on fragile locations, it is quickly becoming a form of pollution of an unprecedented nature. 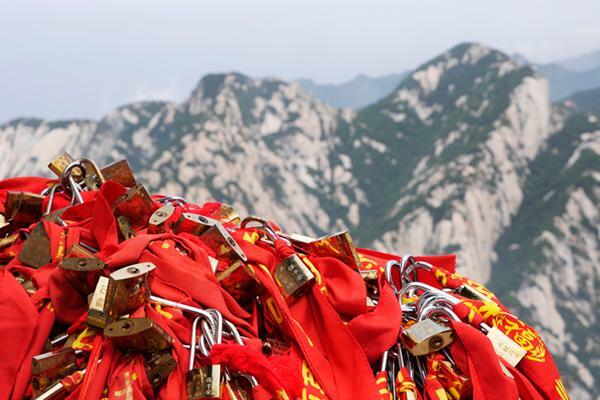 From historic bridges in Europe (the Pont des Arts in Paris is a practically attractive target of the lock and leave brigade) to the mountains of China, there seems to be a growing acceptance by both the public and the authorities that this is an OK form of self-expression. As photographers we notice this growing tide of visual pollution that is engulfing some sites and on a recent photo mission in China I noticed that the presence of these shiny brass and steel objects had became a dominant feature of the spectacular landscape. Huashan is a spectacularly beautiful and majestic mountain in central China and its cultural and visual assets attract numerous visitors and day trippers. The significance of the place therefore becomes a temptation for people to leave behind a “souvenir” of their visit. They want to “lock in” their memories and conveniently placed stalls on the mountain give people the easy option to lock and leave. In theory a few locks left behind sounds reasonably harmless but with a steady flow of tourists with a significant number wanting to leave their small memento, the landscape quickly becomes a scrap heap of rusting and visually polluting lumps of metal. Also as the more easy places to leave your lock becomes harder to find, creative individuals start leaving them on trees and even attached to cultural artefacts and buildings. The authorities of these at-risk sites worldwide, need to quickly put in place practices that control this epidemic or these spectacular and important locations will become buried in metal ephemera, which ultimately will need expensive and potential site damaging removal remedies. If they don’t want to ban locks completely - the environmentally best but politically most sensitive solution, then designating specific and tightly monitored “lock areas” with a corresponding “no locks” tolerance to locks placed out of the permitted zone is the best way to educate the public and control the random nature of the current situation. As with graffiti, instant removal is the proven way to stop people leaving their permanent mark on a place. Also, if locks are going to be sold at the heritage location (a rather short-sighted policy) then at the least they should have special soft metal clasps so they can be easily removed after a defined time. Global tourism numbers are expected to increase substantially over the next decade and this month the UNESCO World Heritage Committee is meeting to inscribe more sites onto the World Heritage list, which will no doubt increase visitor numbers to those special locations. How many of these will visitors leave a memento to "lock in" their visit? It is important for authorities in the numerous locations being locked up, to quickly begin a concerted effort to control and hopefully eventually bring an end to this latest version of that need of some people to leave their mark on the world’s most precious locations. Our Place on Our Planet.